Posted on April 23, 2014 April 17, 2018 by Marty Schoenleber, Jr. The following article from Kairos Journal is a welcome antidote to the mindless blameshifting rampant in our culture. Sometimes (most times) we feel guilty for one reason, … we ARE guilty. And when we are guilty, there is one remedy in the horizontal sphere of our lives, repentance. In the vertical dimension, repentance coupled with faith in the work of Christ is the only remedy and hope for guilt associated with our choices. In either case, the lack of repentance robs us of a connection to the reality of life. Like a leper who has lost his sense of pain, we injure our hopes for happiness in this life and the next when our hearts refuse to repent. As any athlete knows, pain is information, and useful information at that. As attractive as a world without pain might seem, the reality is far from desirable. 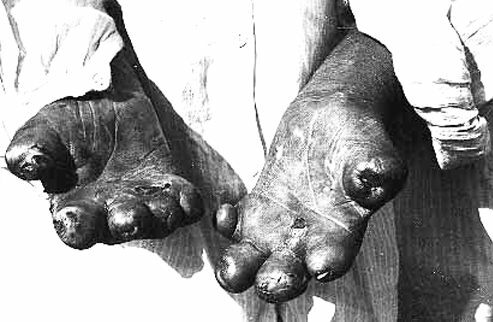 The absence of pain is a serious pathology, characteristic of leprosy. The leper’s great curse is that he cannot feel pain, so, without realizing it, he puts his hand in the fire, and it becomes burnt beyond use. His feet become damaged and infected without his knowledge, and untreated, they are ruined. The sense of guilt, like any other pain, is information. A complete loss of that faculty is the moral equivalent of leprosy. The conscience of the individual—and society—can be seared. Writing about his work as a prison psychiatrist in England, Theodore Dalrymple notes the prisoners’ responses to their fate. Denial is universal, not of the crime itself, but of responsibility for their actions. On asking, “What are you in for?” Dalrymple often receives replies such as, “just ordinary burglaries,” “just an ordinary assault,” and even, “just a poxy little murder charge.”1 They believe that their actions are inconsequential and normal. Indeed, according to Dalrymple, criminals in contemporary Britain feel that they are victims of a great injustice when they are incarcerated for their crimes. They need understanding and help, not punishment. Of course, self-justification is not limited to the criminal fraternity. Impatience with personal responsibility is now very much en vogue throughout society. It feeds on moral relativism and the utopian desire amongst the intellectual elite to rid life of unpleasant feelings altogether. This is indeed a heady mix. If no action is absolutely wrong (apart perhaps from something that would interfere with another individual’s self-determination), and feelings of having done wrong are unpleasant, then the obvious solution is to treat guilt and shame as the problem rather than the behavior that led to it. Even where someone has violated the autonomy of another, two wrongs do not make a right; there is no point in adding to the total amount of suffering by making someone else feel bad: who is helped by that? Therapy, rather than punishment, is the appropriate solution. After all, a person’s behavior is the consequence of a very complex combination of genetic and environmental factors . . . Once a few such arguments have been piled up, personal moral guilt disappears in a puff of logic, and moral leprosy takes over. Plain speaking is the servant of repentance and the healing it brings. Dalrymple’s mother cut through all the foolishness, calling sin “sin”—just the sort of thing good preachers do before moral leprosy and irreversible damage begin. 1.Theodore Dalrymple, “How Criminologists Foster Crime,” City Journal Website, Autumn 1999, http://www.city-journal.org/html/9_4_oh_to_be.html (accessed March 11, 2004). The Nonsensical World of Public Policy and Better Ministry in Light of It. A major part of the problem is that we have been conditioned to think of ourselves as victims rather than as beings with the ability to exercise choice. The Bible always gives the proper diagnosis, we just don’t like the medicine.